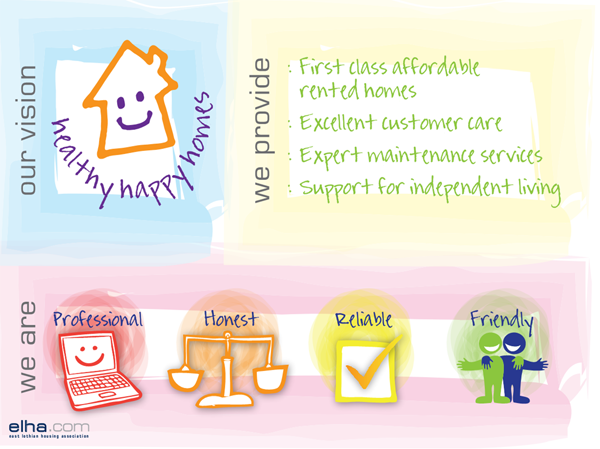 We build and manage a wide range of properties to meet a variety of needs within East Lothian. From our office in Haddington, we currently manage around 1,400 properties for rent and shared ownership throughout East Lothian. Our Management Committee is made up of volunteers who are Members of the Association. You can find out how to become a Member of ELHA and more about our Management Committee Members by clicking the links below. A Register of our Members may be available on request by e-mailing us at enquiries@elha.com or by calling us on 01620 825032. 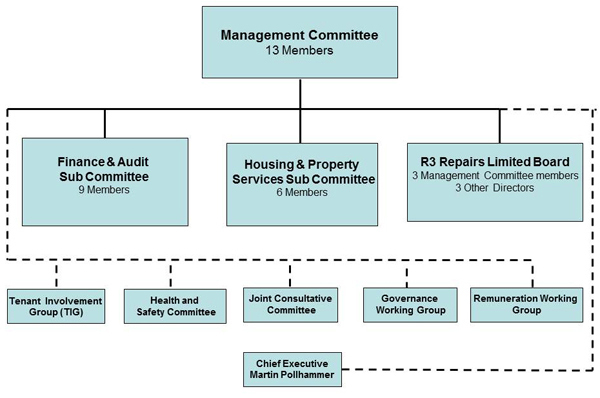 Our Management Committe is responsible for setting our strategy, policies and financial decisions, but delegates day to day managment of the business to staff led by our Chief Executive and our Senior Management Team, whose profiles are provided below. 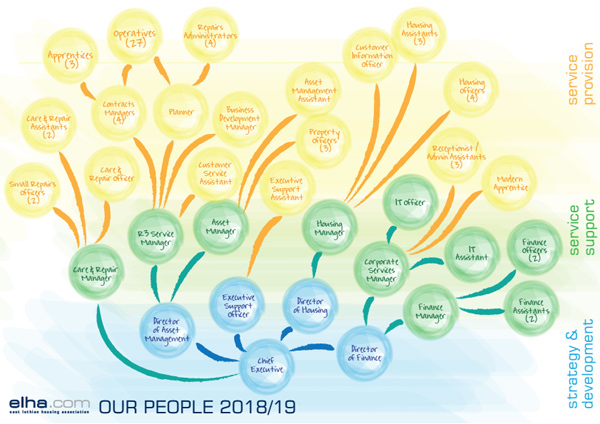 Although we have departments or service areas, with a Manager for each service area, the principle of our structure is based around three zones – Service Provision, Service Support and Strategy and Development. The purpose of our business is to provide services, therefore the majority of our staff work within the Service Provision zone. Those in the green Service Support zone provide vital support services and management to those in the yellow zone. The Senior Management Team forms a small nucleus in the blue zone responsible for overall strategy and development. The design of our People Chart is also significant. Senior staff are at the bottom of the chart, not at the top. There are no hard “top down” lines of seniority, instead the lines are designed to show a supportive structure. Whilst, of course, staff must follow instructions their managers give them, the principle is that the Service Provision zone is the most important, and the objective is to ensure that staff in that zone have the tools, support, knowledge and training they require to provide those services as effectively as possible. Their support and development needs should filter down through the structure, and it is the responsibility of staff in the green and blue zones to provide and/or develop that support. 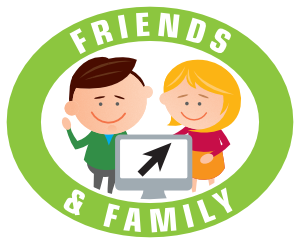 We are full Members of Employers in Voluntary Housing (EVH) and ELHA staff are employed on EVH Terms & Conditions and EVH payscales. 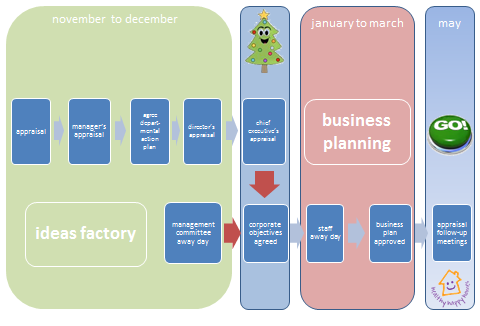 The diagram below illustrates our corporate planning process. While ELHA is committed to openess and transparency in all of our work, our subsidiary company, R3 Repairs Limited is a commercial business, and our business plan may contain commercially sensitive information. If you would like any information contained in our business plan, please get in touch and we will do our best to help. In 2015 we adopted the Scottish Federation of Housing Association Charitable Model Rules (Scotland) 2013, which were published by the Scottish Federation of Housing Associations (SFHA) in co-operation with the Scottish Housing Regulator (SHR). We are regulated by the SHR and the Office of the Scottish Charity Regulator (OSCR). Our level of engagement with the SHR is low, but we do have an Engagement Plan, as we are developing new properties. Although we operate in a comprehensively regulated sector, we are also very clear about the standards of probity and professionalism expected of our volunteers and staff. The documents below provide an insight into the high standards expected. We maintain registers of relevant information about, for example, any incidents of fraud or theft or bribery, and these may be accessed by e-mailing enquiries@elha.com or calling on 01620 825032. Partnership working is key to what we do, and although we don't have any partership projects ongoing at the moment, we work with many organisations and individuals on a regular basis to acheive our goals. More information can be found below.